One of the areas of significant growth in medical devices has been the role of software. It can function as an integral component of a medical device, as a standalone device, or, more recently, as an application on mobile devices. Unfortunately, it's not always clear what regulations apply to software. 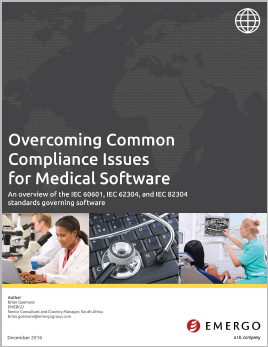 Regulatory authorities across the globe have provided little (or confusing( guidance, leaving developers to question: When is software considered a medical device? Brian Goemans is the Country Manager, South Africa and a Senior Consultant at Emergo. Brian is a biomedical engineer with more than 20 years of experience in medical device product design and development, and 15 years in medical device regulations. His expertise includes hardware and software development for medical devices, telecom systems and consumer devices, program management, and software lifecycle development. Brian previously held positions at Cape Biotech, Sitwala, and Flextronics.